Five cases of police misconduct had new developments last week. Here’s a look at what happened and what’s next for the families of the victims and the officers involved. 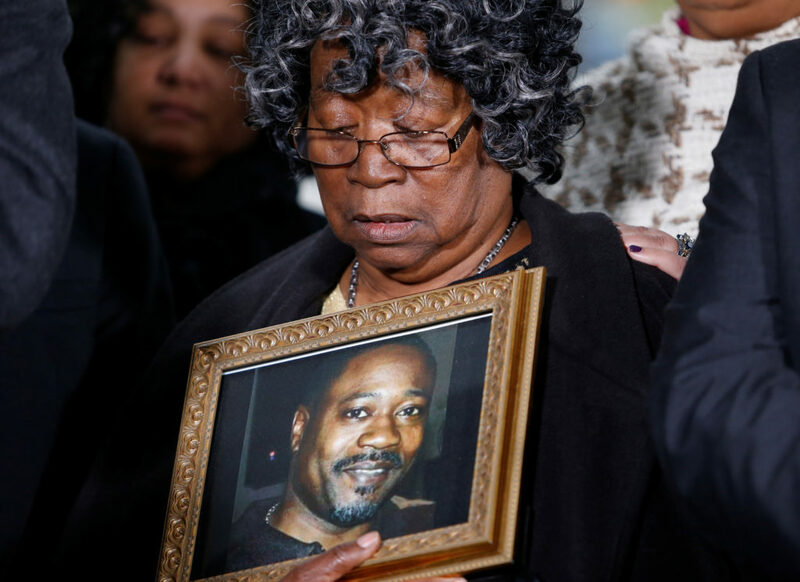 Judy Scott looks over a photo of her son Walter Scott during a news conference after former police officer Michael Slager was sentenced to 20 years in prison, in Charleston. Photo by REUTERS/Randall Hill. In April 2015, North Charleston police officer Michael Slager pulled over Walter Scott for a broken tail light. What happened next is uncertain. Slager says the two fought for his taser. But in a bystander cell phone video, Scott is seen fleeing the scene, as Slager fatally shoots the 50-year-old multiple times. The video also shows Slager putting his taser on the ground next to Scott. In court, Slager said he was securing a weapon; the prosecution argued he was planting evidence to bolster his defense. A previous trial by the state resulted in a hung jury. In May, Slager pleaded guilty to federal civil rights violations and the state dropped the murder charges. The Latest: On Wednesday, Slager was sentenced in a federal court to 20 years in prison for violating Scott’s civil rights. The judge found that the shooting went beyond manslaughter to second-degree murder, and said Slager used excessive force. The case is unusual in that it is rare for police officers to be convicted for fatal shootings. Often, cases end in acquittals and mistrials, if an officer is indicted at all. After Slager’s sentencing, the Scott family said they were “pleased” with the result. What’s next? Slager and his attorneys have 14 days to appeal the verdict, a possibility since the sentence is nearly twice what they’d hoped. Because the trial was in federal court, Slager will not be eligible for parole. 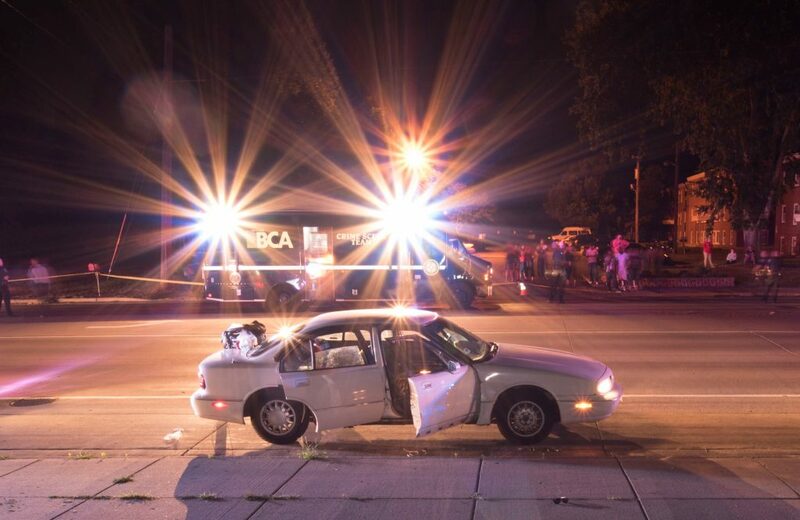 In July 2016, Philando Castile was driving with his girlfriend, Diamond Reynolds, and her daughter in Falcon Heights, Minnesota, when he was pulled over by officer Jeronimo Yanez. Castile told the officer he had a gun, which he carried legally. Dashcam video released this past summer documented Yanez telling Castile not to reach for his gun; Reynolds testified that Castile was reaching for his ID. Castile can be heard telling the officer he wasn’t reaching for his gun, but Yanez repeated his command and immediately fired seven shots into the car. Castile died at the hospital. Reynolds began livestreaming the aftermath on her cell phone, garnering worldwide attention. Additional footage released later showed Reynolds in handcuffs with her daughter in the back of a police cruiser. In November 2016, Yanez was charged with manslaughter; he was acquitted of all charges in June. A month later, the St. Anthony police department removed Yanez from the force. The former officer was bought out for $48,500, plus up to 600 hours of unused personal leave pay. “While no amount of money can change what happened, bring Philando back, or erase the pain that my daughter and I continue to suffer, I do hope that closing this chapter will allow us to get our lives back and move forward,” she continued. This latest payment follows a $3 million settlement earlier this summer between St. Anthony and Castile’s family. What’s next? Now that the cities have settled with Reynolds and the Castile estate, the case is essentially closed. A boy sits next to a makeshift memorial outside the Triple S Food Mart where Alton Sterling was fatally shot by police in Baton Rouge, Louisiana. Photo by Jonathan Bachman/Reuters. A little after midnight on July 5, 2016, Baton Rouge police officers responded to a call of a man with a gun outside a Triple S food mart. When they arrived, they found Alton Sterling, who often sold CDs outside the store, owner Abdullah Muflahi said. Two subsequent bystander videos, one by Muflahi, show two officers wrestling Sterling, 37, to the ground. Someone can be heard shouting, “He’s got a gun! Gun!” before an officer shoots multiple times. 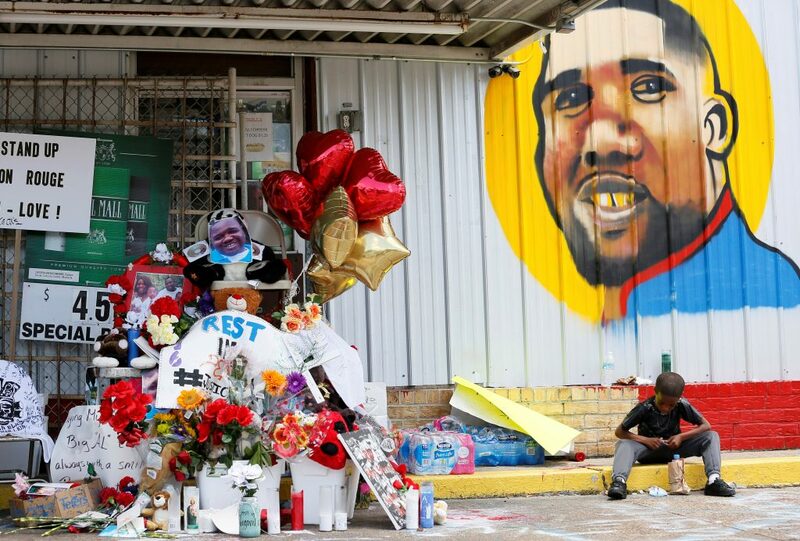 The officers were not charged in his death, prompting protests in Baton Rouge over the decision. More than 100 people were arrested as a result. Many of those arrested in protests immediately after Sterling’s death participated in a class-action lawsuit, and in October, a judge awarded a $500-$1,000 settlement to each participant. Weeks later, another lawsuit claimed that police officers used excessive force when they arrested dozens protesting Sterling’s death. The Latest: On Dec. 4, three people sued the city of Baton Rouge and Mayor Pro Tem Scott Wilson, claiming unlawful removal from a city council meeting last May. At the meeting, which was a week after the officers were not charged, the speakers say their First Amendment rights were violated when police officers removed them. The meeting was about sewer backups, and when the council called for public comment, multiple speakers came up to address Sterling’s death. In total, six people were removed from the meeting. The speakers, Gary Chambers, Mike McClanahan and Eugene Collins, allege the mayor discriminated against them and their views because they are black. Wilson said at the time the speakers were deviating from the stated subject of the meeting. The three plaintiffs are only asking to cover court costs and legal fees. Instead of a settlement, they hope that Wilson will be forced out if the court finds he acted illegally. What’s next? The Louisiana Attorney General is still reviewing the case to determine if the state should bring charges against the officers. FILE PHOTO: Baltimore Police Officer Caesar R. Goodson Jr., Officer Edward M. Nero, Officer Garrett E Miller (top L-R), Officer William G. Porter, Lt. Brian W. Rice, Sgt. 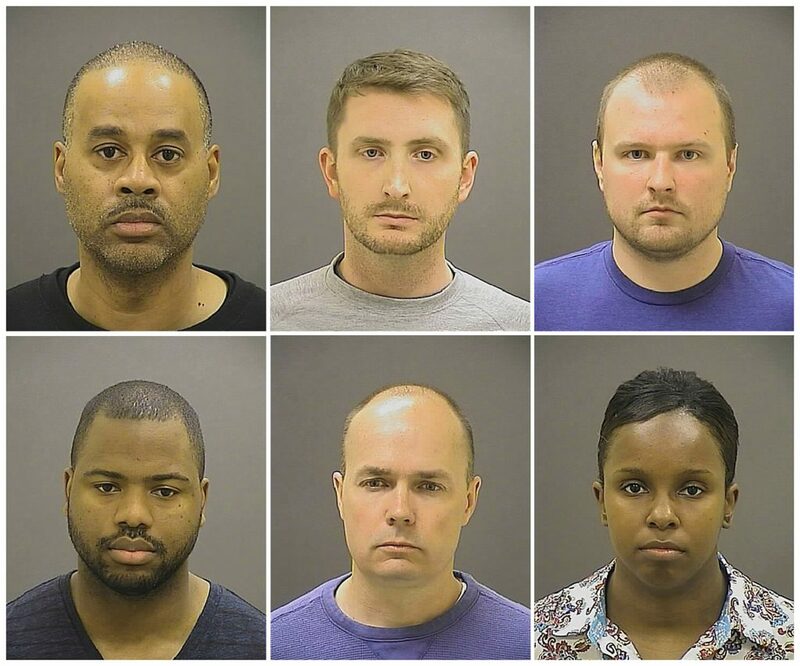 Alicia D. White (bottom L-R), are pictured in these undated booking photos provided by the Baltimore Police Department. Baltimore’s top prosecutor on July 27, 2016 dropped remaining charges against police officers tied to the death of black detainee Freddie Gray, after failing four times to secure convictions in a case that inflamed the U.S. debate on race and justice. 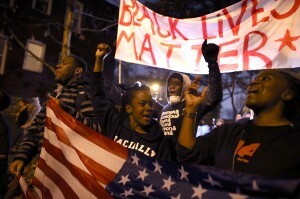 File Photo courtesy of Baltimore Police Department/Handout via REUTERS. Last year, state prosecutors decided to drop charges against three of the six officers involved in the 2015 death of Freddie Gray, who sustained a fatal spinal injury in the back of a Baltimore police van. This was announced after the three remaining Baltimore officers had been acquitted in the 25-year-old black man’s death. In September, the Justice Department announced that none of the six officers would face federal civil rights charges, either. The latest: After charges were cleared on the federal and state levels, Montgomery and Howard county police departments, whose officers responded to the initial incident, brought internal charges against five of the six officers, citing violations of department rules, The Baltimore Sun reported. To date, two of the officers have accepted minor disciplinary actions. All charges against the driver of the van, officer Caesar Goodson Jr., were dropped in November. All charges against Lt. Brian Rice were also dropped the following week. The administrative trial for Sgt. Alicia White, the last officer to face internal discipline in the case, was originally scheduled for Dec. 5. But, a police commissioner decided to not proceed with the hearing. White will not face further internal consequences. What’s next: “After all the trials and police disciplinary proceedings, we still don’t know what happened in the back of that van,” The Sun wrote in an editorial after the last officer White’s administrative hearing was dropped. The Baltimore police have made changes following Gray’s death: New police vans are equipped to better handle passenger safety and are fitted with cameras to monitor officers’ actions. The city also launched a program to have patrol officers wear body cameras. But the newspaper argued that we need to “do more than talk” to prevent a similar death in the future. That means evaluating how well the city addresses the restrictions in its continued consent decree with the government, including changes to how an officer approaches a possible suspect. Six years ago, a former St. Louis police officer shot and killed Anthony Lamar Smith after an attempt to arrest the black motorist. On Dec. 20, 2011, Jason Stockley and his partner approached Smith, who they thought was involved in a suspected drug deal. The encounter eventually led to a high-speed pursuit as Smith fled the scene in his vehicle. The chase ended when Stockley, captured by a dashcam, told his partner to crash into Smith’s vehicle. Getting out of the police SUV, Stockley then fired five shots at Smith, who was later pronounced dead at a local hospital. 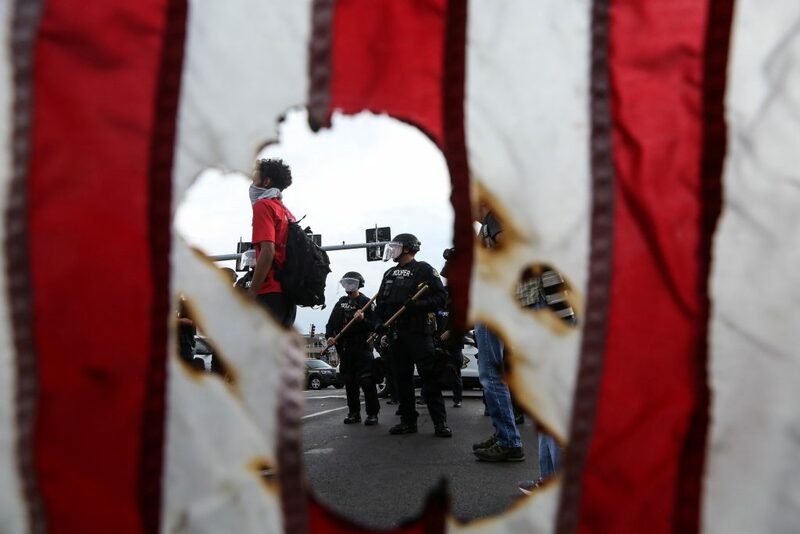 After years of the case lingering in court, a Missouri judge acquitted Stockley in September of first-degree murder in Smith’s death, a decision that sparked weeks of new protests in a city that was also rocked by the 2014 death of Michael Brown in nearby Ferguson. The latest: An independent investigation ordered by Republican Missouri Attorney General Josh Hawley found that a senior attorney who worked for the officer of former Attorney General Chris Koster, a Democrat, knowingly withheld DNA evidence while the state was negotiating a wrongful death settlement with Smith’s family, the St. Louis Post-Dispatch reported. During the trial, prosecution representing Smith’s family argued that Stockley’s DNA was the only genetic material identified on the revolver that was recovered from Smith’s vehicle after the shooting. While this evidence was used in the court case earlier this year, it was not available to Smith’s family when they were trying to reach a settlement with the city’s police department years ago. Attorney Albert S. Watkins told the newspaper that the DNA evidence would have helped Smith’s family obtain a larger settlement than the $900,000 that was given to them in 2013. What’s next:The civil case could be reopened, Watkins said, to allow the Smith’s family receive a higher settlement.